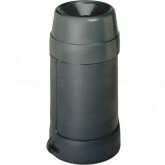 This big mouth receptacle encourages use because of its appealing open, Funnel Top design. 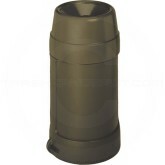 With absolutely no metal parts, these containers are safe for secure areas in hospitals or prison systems. They are available in color choices to compliment any decor. The unique "key-way" feature and shoulder design allows poly liner to be secured, hiding unsightly "bag skirt". 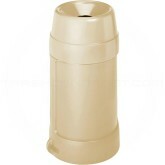 Plus, the built-in lock ring secures Funnel Top from theft or high winds. Colors: Gray, Black, Brown or Beige.